Carnival in Basel is an experience like no other. It’s extravagant, it’s loud, it’s crowded, it’s a great big deliciously cacophonous mess. 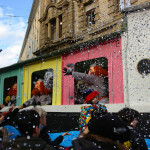 The biggest carnival festival in Switzerland, the Basler Fasnacht is an historic and fun event that you must experience at least once in your lifetime. It all starts with Morgästraich, that moment at 4:00 in the morning when, after what feels like the entire city has gathered downtown, the lights go out and the Cliquen (groups who are part of the festival) start their first march, all at the same time. 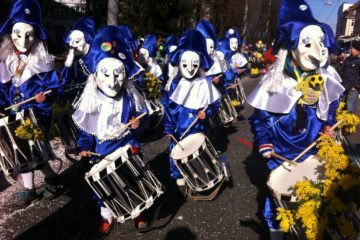 Hundreds of Fasnächtler, or Fasnacht-participants, dressed in elaborate costumes compose the Cliquen, playing their tunes with flutes and drums, marching in a massive parade of colours and lighted lanterns, with bright handcrafted carts and displays usually saturated with political satire. (Try to attend this with a Swiss friend so they can explain the jokes!) And the Fasnächtler carry on as the morning dawns, taking breaks to warm up now and then at a local bar before heading out again. The carnival itself lasts for 72 hours straight, running until Thursday morning at 4:00 a.m. 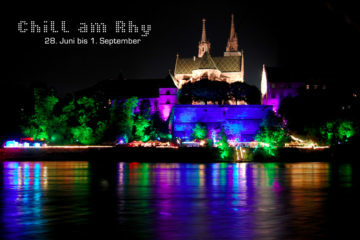 These three days, called the drei schöoenschte Dääg or the ‘three most beautiful days,’ are a non-stop celebration, with special parades on Monday and Wednesday called Cortège as well as other parades all throughout the city. Another fun part of Fasnacht is the Guggemusik — brass bands who play everything from classic folk to modern pop songs. The Gugge participate at Cortège on Monday and Wednesday, but Tuesday night is dedicated especially to the Guggemusik, with concerts spread out through the centre of the city, at Barfüsserplatz, Marktplatz, and Claraplatz. Buy a klöpfer and Feldschlösschen lager at the food stand and enjoy a fun evening of lively music. 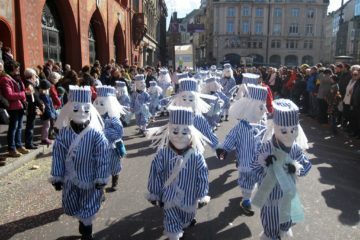 Tuesday is also the day for the Children and Family Fasnacht, where children can take part in the marches with their parents. Monday through Wednesday evening, you can catch ‘Schnitzelbänke,’ when performers sing satirical songs about current events and personalities. More info. You’ll enjoy dozens and dozens of floats during the parades, and you might get thrown an orange or other treat from one of the wagons. But you might also get stuffed with Räppli — colourful paper confetti. (And once it gets in your house or flat, you’ll be able to remember Fasnacht all year long, as you’ll continue to find it during your housekeeping for the rest of the year!) 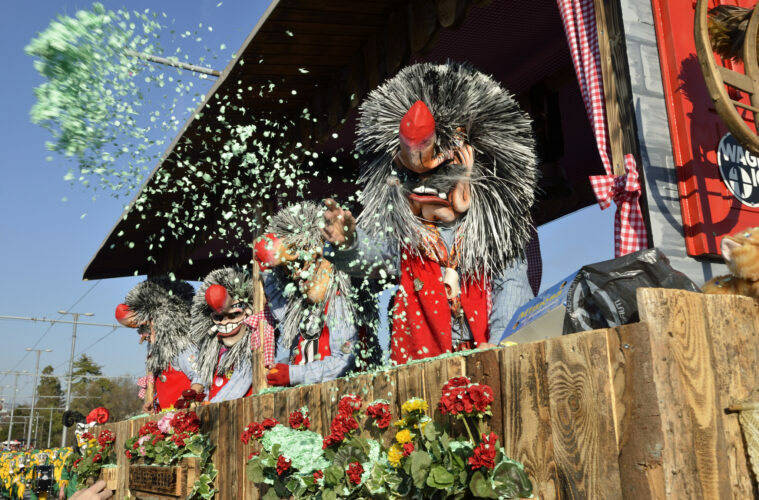 The best way to ward off confetti-throwers is to buy a Fasnacht Blaggedde, a badge or pin worn during the festival, which you can buy in the weeks leading up to Fasnacht. Yet even with the pin, there’s a fairly good chance that you’ll still get showered in Räppli at some point during the festival! 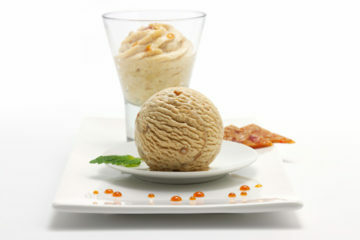 Besides Mehlsuppe, Chäschüechli, and sausages and beer, there are several treats you can look forward to for Fasnacht. Try Faschtewaihe, a white, pretzel-shaped bread topped with cumin seeds found at bakeries like Sutter and local supermarkets. For a sweet treat, head to your favourite confiserie, Migros, or Coop for some Fasnachtschüechli—delicious deep-fried pastry topped with powdered sugar. There’s much to love about Fasnacht! 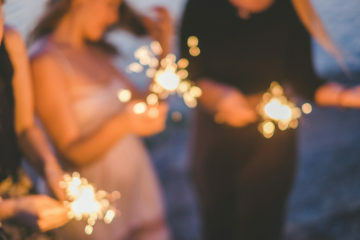 What’s your favourite part of the festival? Tell us in the comments! 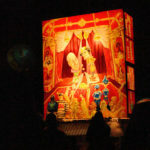 For more info, visit Fasnachts Comité at www.fasnachts-comite.ch or Basel Tourism. Basler Fasnacht 2016 – Already? 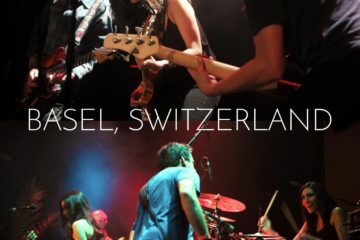 Excellent initiative…..We relocated here in Basel a week back. coming from Pune, India we are happy to to see alot of social and cultural activities going on…Good luck to the organisers! !